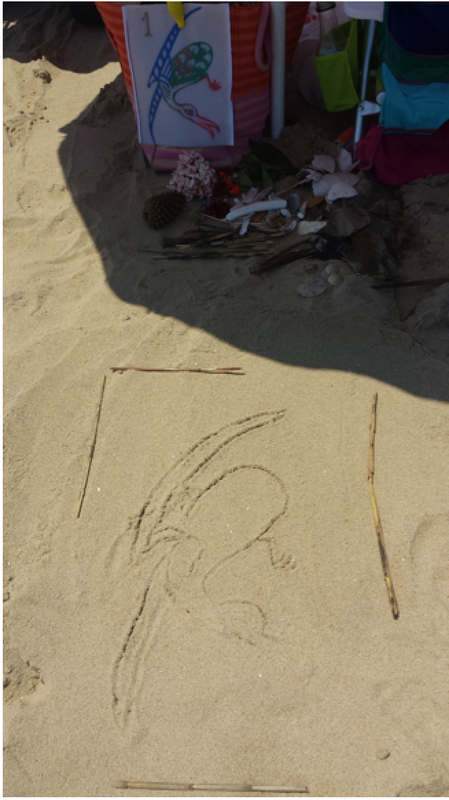 MAH JONGG CREATIVITY ON THE BEACH! “Gorgeous day at the beach – Rick and I spent seven hours there in our bit of paradise. It is that time of the year for… mahjong beach art. Okay, I cheated a little and took a few flowers with us from the backyard. 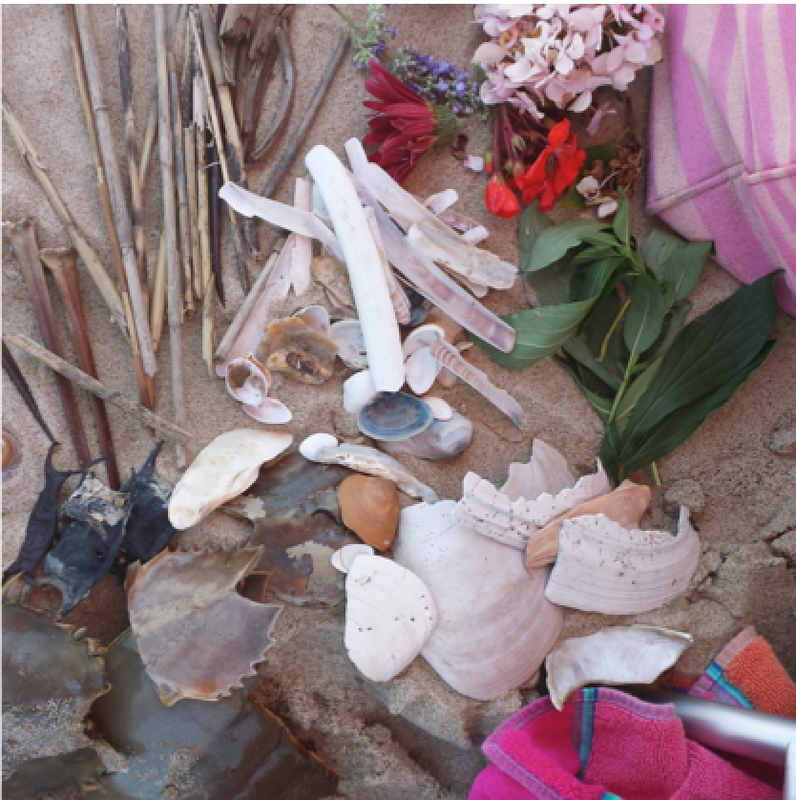 The rest was all found along the coast of Virginia Beach. The inspiration for this piece is a One Bam Crane tile from a set made by the German manufacturer, Marke Pehafra. 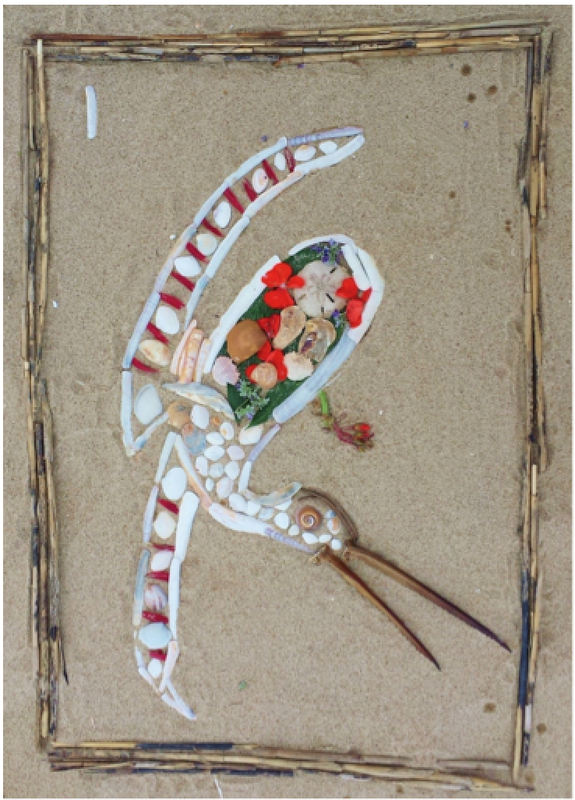 The beach art tile is made from: oyster shells, razor clam shells, scallop shells, crab shells, periwinkle shell, horseshoe crab tails, sand dollar, various other shells, sea oat grass, peony leaves, gerbera daisy petals and geranium petals and stems. 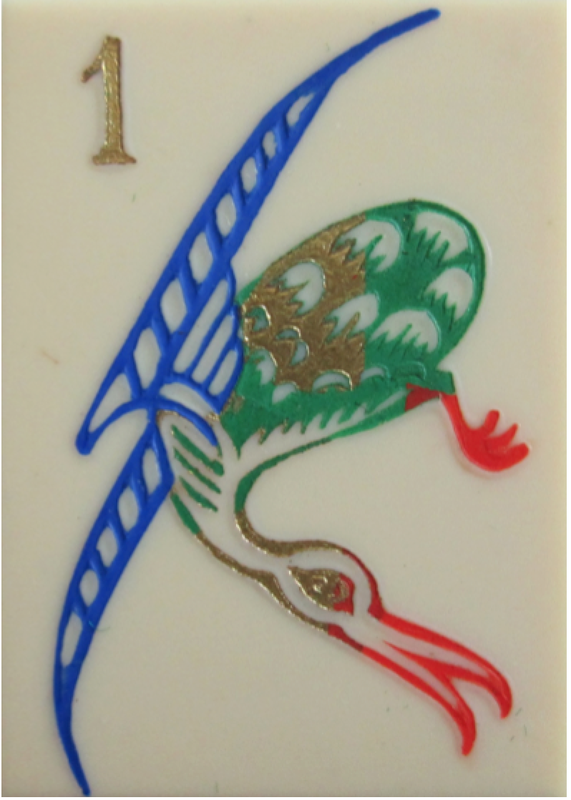 Life is good!” Here is the inspiration for Kat’s beach art: a Marke Pehafra One Bam tile from circa mid 1920s. Before Kat left home she blew up an image of the One Bam tile and clipped it to her beach bag for reference. 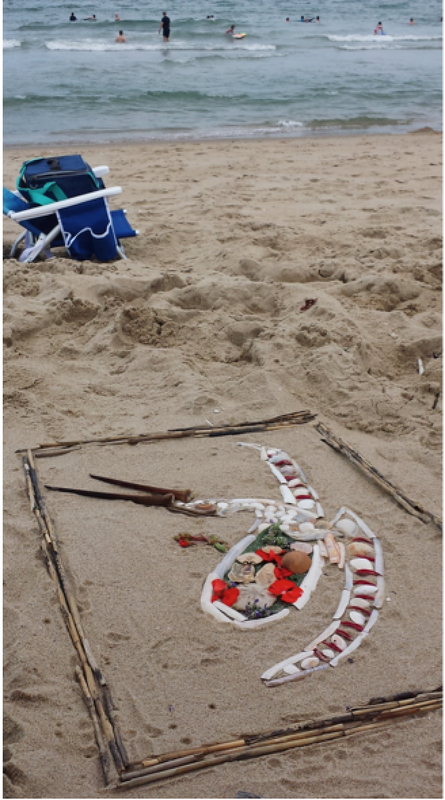 With a horseshoe crab tail, she made a rough sketch of the design in the sand: 30 minutes later, Kat and Rick were finished with their work of art, all the while fighting the wind and wishing the shells were flexible… In the end, they were covered with sand and, after a swim in the ocean to rinse off, these photos were taken…and, finally, it was time to relax and enjoy their beautiful beach art and the perfect day! This entry was posted in Mah Jongg and Me and tagged bamboo, German, mah jongg, mahjong, Marke Perafra, Virginia Beach on July 10, 2016 by Mah Jongg and Me. 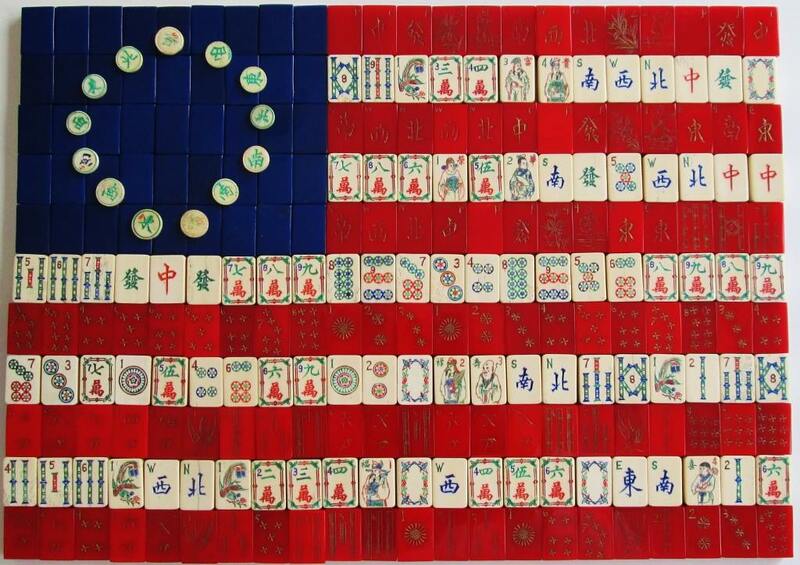 A day to remember how lucky we are to live here in the United States of America…and in honor of the day, another look at the amazing flag created by Kat: A closer look and an explanation: A Mah Jongg – or should I say, a Kat – rendition of a Betsy Ross flag made from the casein blue backs of tiles, red casein tile faces, faces from bone and bamboo tiles and, finally, the stars are bone wind disc indicators. Thanks to Kat for this very special treat! 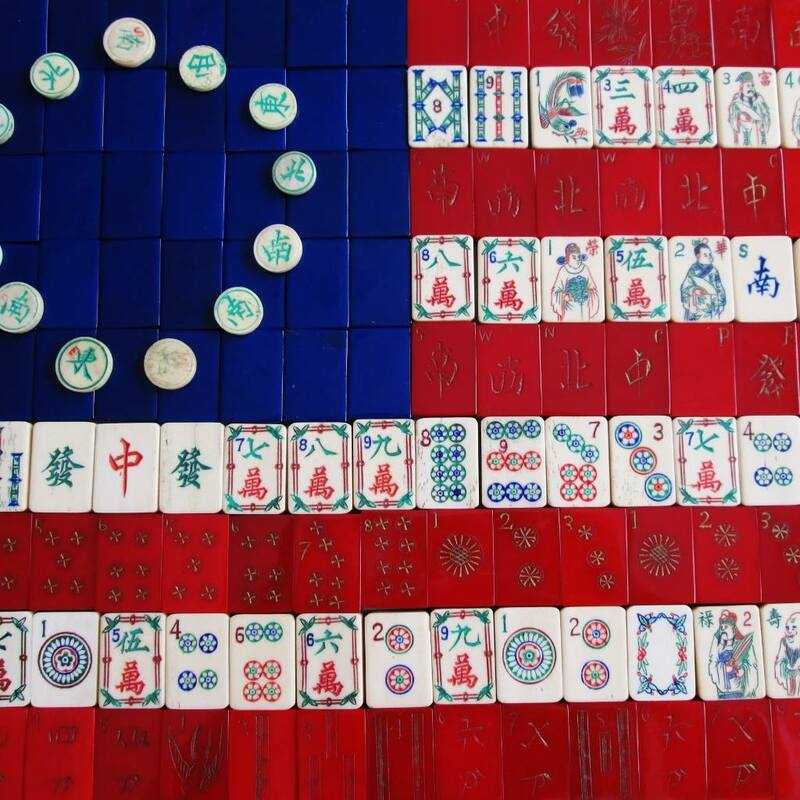 This entry was posted in Mah Jongg and Me and tagged 4th of July, bamboo, Betsy Ross, bone, casein, mah jongg, mahjong, United States of America on July 4, 2016 by Mah Jongg and Me. 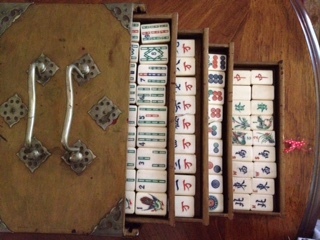 A while ago I received an email from Diane G asking for help on identifying a box containing bone and bamboo tiles, which she bought at an estate sale a few years back. 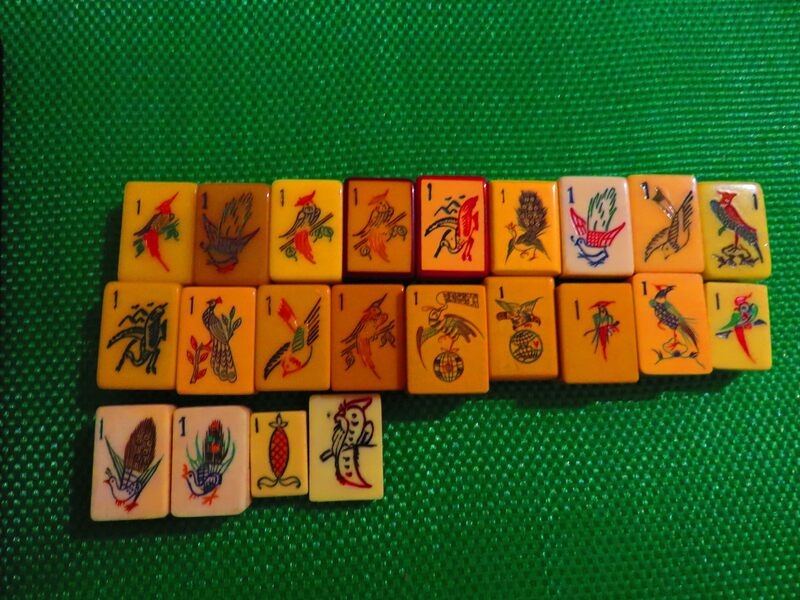 I looked at the only photo of the tiles that Diane sent and am fairly confident that these tiles were made by the Mah Jongg Sales Company of America. 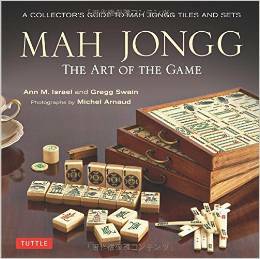 But the Mah Jongg Sales Company of America almost always put their name on their boxes – nowhere does their name or logo appear on this particular box. 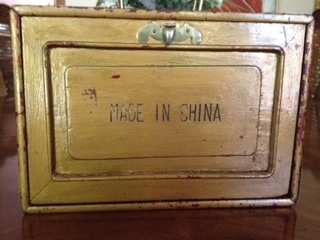 Apparently made of rosewood, this box has been painted gold and, as Diane pointed out, was clearly made for the American market as you can see from the words written in English, “MADE IN CHINA,” displayed on the back. The question Diane is asking is whether or not this is the original box for these tiles. What company used the little guy holding perhaps a drum or a gong or a lantern – (I really don’t know what he is holding)? Which one of you out there has seen this logo before? 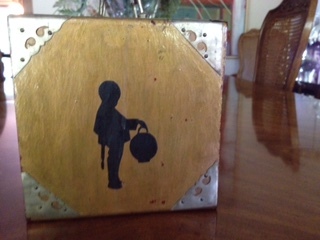 Or, as I suggested to Diane, did the person who painted this box also add this sweet little figure that looks like something from an A.A. Milne book after he or she painted over the rosewood? Tony? Tom? Michael? Any thoughts? Diane would love to know and now, so would I! Please send me your thoughts and I will publish them in a later post. And Diane, thank you for the lovely message you sent along with these photos – it means the world to me. 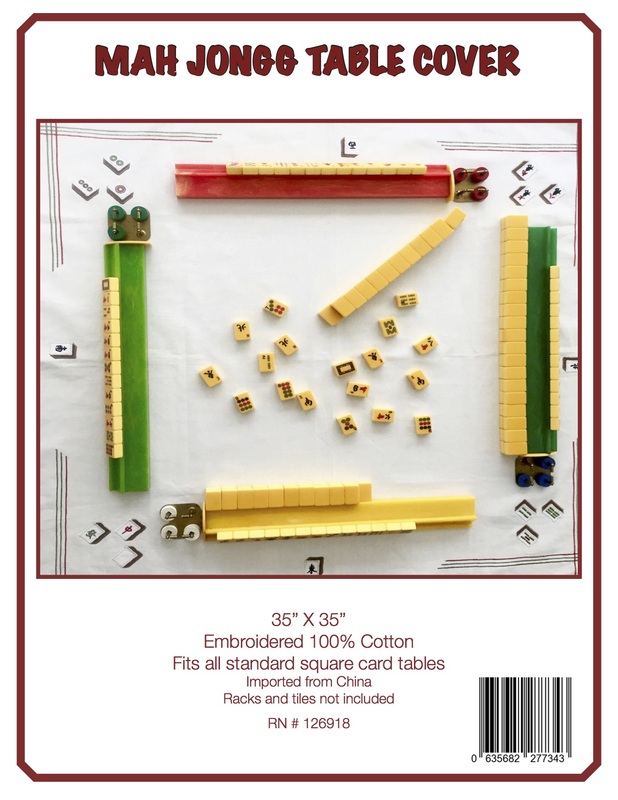 This entry was posted in Mah Jongg and Me and tagged American market, bamboo, bone, drum, estate sale, gong, lantern, made in China, mah jong, mah jongg, Mah Jongg Sales Company of America, mahjong, rosewood on September 15, 2015 by Mah Jongg and Me. I had ordered some hand wipes from Amazon and so, when the package arrived today, I didn’t rush to open it as I knew what it was…or so I thought! I finally opened the package and to my great surprise, it was filled with gifts from dear Joy Hamilton in Canada. 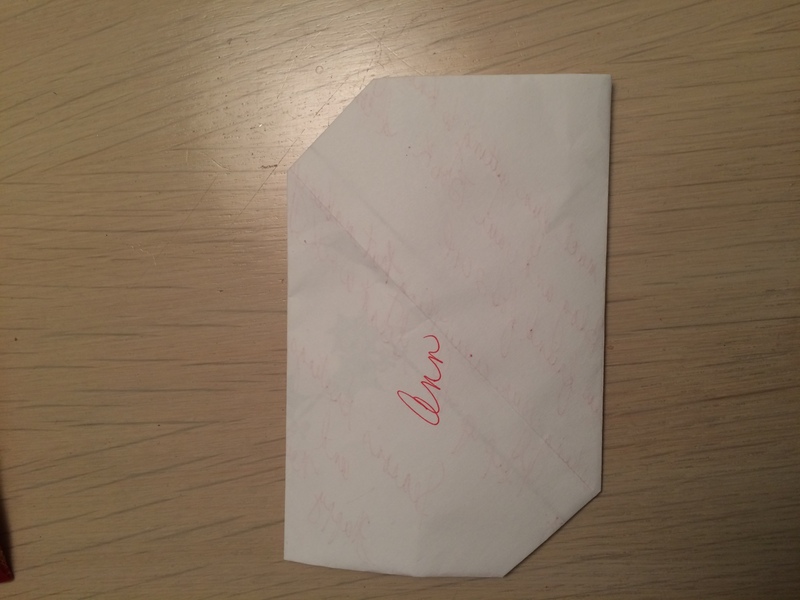 Joy and I have never met but have become virtual friends through this blog. I am so honored and thrilled that Joy has sent me such beautiful and thoughtful holiday gifts. 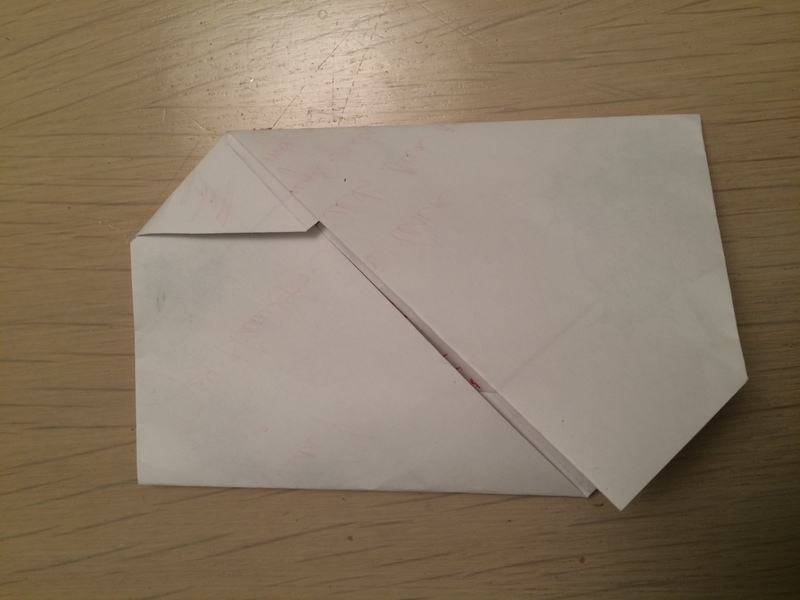 This entry was posted in Mah Jongg and Me and tagged bamboo, Canada, candy, fan, gin-gins, Joy, mah jongg, origami, silk, wind chimes on December 23, 2014 by Mah Jongg and Me. …well, here comes BIRD WARS! You’d better sit down because you are about to see some of the most spectacular One Bams ever!!! These tiles are all ivory, bone and bamboo, and bone and ebony tiles. 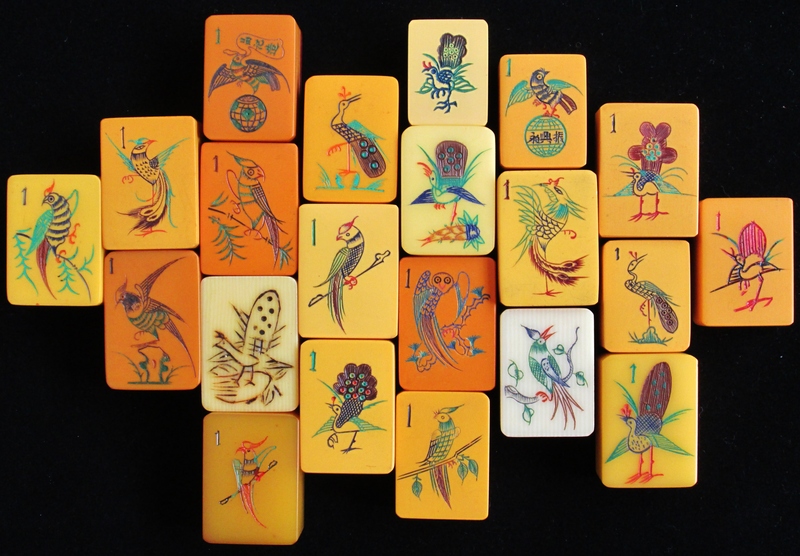 These tiles are resin, Chinese Bakelite, Chinese Catalin and French ivory. All of these One Bams have something in common – they are all hand-carved. Wow!!! And they are all part of the breathtaking collection – kept locked away in a secure location, of course – belonging to my dear friend, the wonderful, ethical, fantastic, and knowledgeable seller of vintage sets, Fracas1 – click on this link to see the beautiful vintage sets she has for sale on eBay. These One Bams are all bamboo tiles, from 1920-1980, courtesy of my great friend, Tony. Double wow! 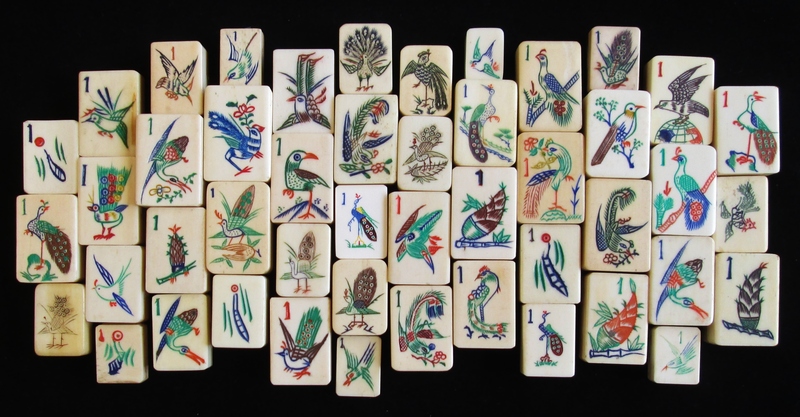 These come from the collection of Shirley, who has been known to save the day for readers of this blog with matching tiles from her incredible orphanage. Triple wow! Thanks to Fracas1, Tony, and Shirley, for so generously sharing these fabulous and amazing One Bams with us! And, before I close today, let me share a poem with the first two lines started by Joy and the second two lines finished in a completely different email by Diane – and I don’t believe they even know one another! This is so fabulous – thanks, ladies! Rode the wind; didn’t look back. This entry was posted in Mah Jongg and Me and tagged bamboo, bone, Chinese bakelite, Chinese Catalin, ebay, ebony, Fracas1, french ivory, ivory, mah jongg, one bam, resin, Shirley Hannick, Tony Watson on November 19, 2014 by Mah Jongg and Me.